Today I want to show you one of our bathrooms. 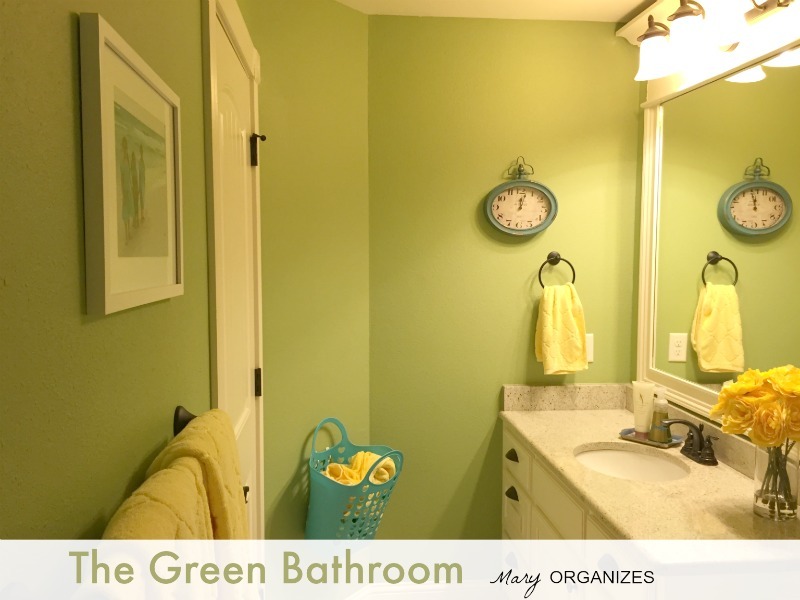 We call this one “The Green Bathroom”. It is the bathroom near the guest room upstairs, but it is also used by my kids some. There aren’t any windows, so the green walls could make the room dark, which is why I’ve decorated with bright accents. 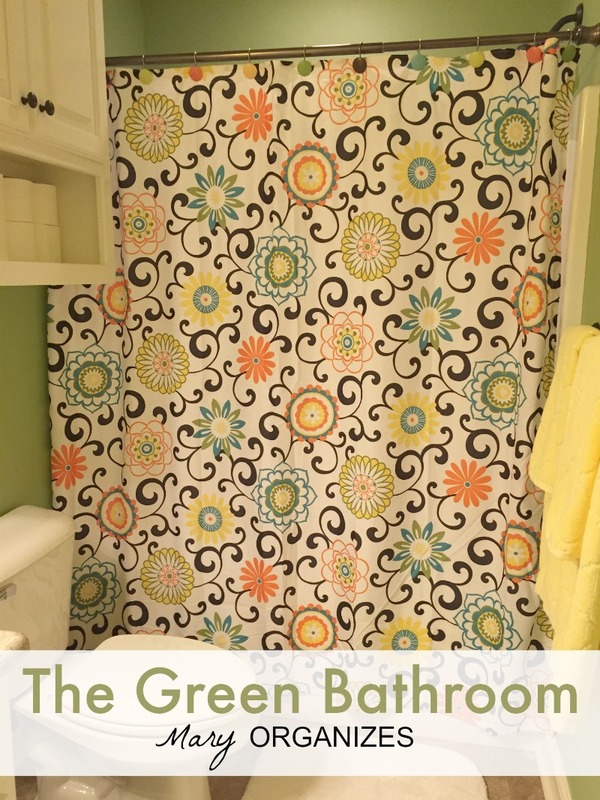 I love the bright, happy vibe this shower curtain gives the room. 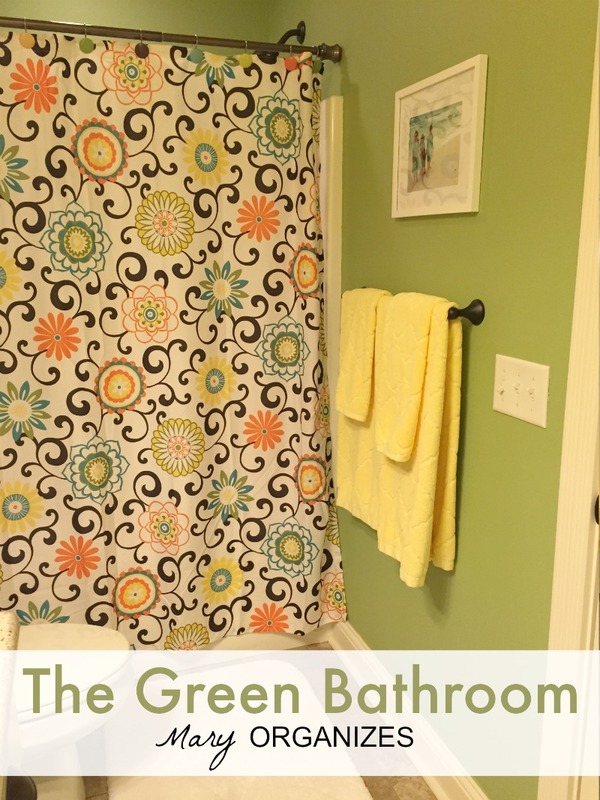 I went with the yellow from the shower curtain when I was picking out the color for the towels. The picture hanging is my kids at the beach last summer. Storage in this room is pretty much just extra toilet paper in the upper cabinet, towels, hand towels, and wash cloths. I hung a little basket on the wall for dirty towels. My kids end up putting their dirty bath towels in the hamper near their bedrooms, and for guests, I do their towel laundry more regularly. When the door is closed, it hides the basket. The blue in the clock brings out the blue in the shower curtain. And the yellow flowers, well, they just make me happy every time I look at them. Yellow flowers = happy, is an actual law of Nature. Yep, totally true. Some of the drawers are empty. I add things to them when guests are coming. I figure as my girls get older, they will want more stuff in the bathroom, so I’m saving room for that. You’ve seen my Master Bathroom. 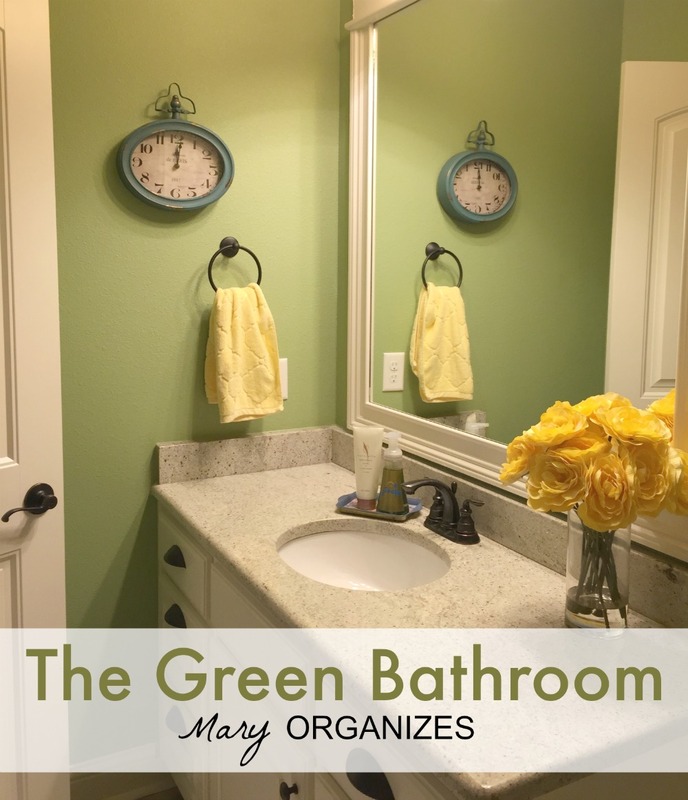 I’ve taken pictures of our other two bathrooms “The Kids Bathroom” and “The Powder Room” … so look out for those posts to trickle in over the next few weeks. I know, you’re on the edge of your seats! I love what you’ve done with this bathroom! 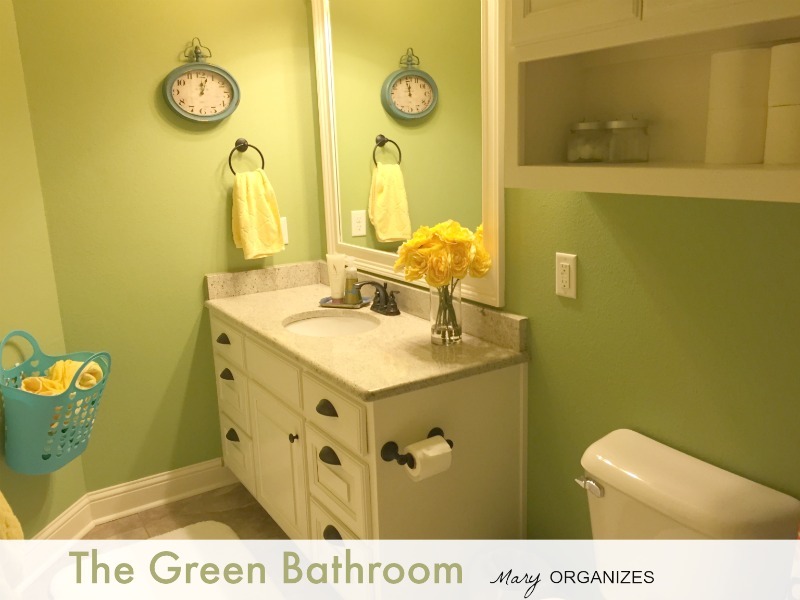 It’s almost the exact same layout as my guest bathroom and you’ve given me some great ideas! Thank you so much for sharing ☺️. R. P.
Someone will surely ask, it may as well be me. Where did you find that shower curtain? It is so bright & fun! I ordered this one on JCPenney.com, but originally found it on Belk’s website (but they were out of stock). I checked Amazon, but JCPenney was the better price. 🙂 It really is bright and fun, just what this space needed! Love your bathroom! 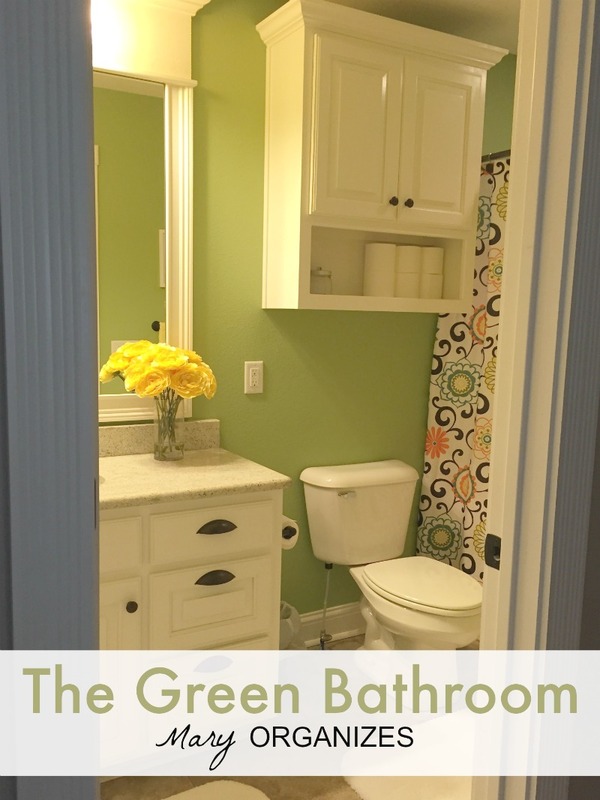 Can you put the toilet paper inthe cabinet and maybe put a candle or potpourri on that shelf? Would looke great!